Use high-power LED luminaires with an IP65 factor and protection agains dust, high temperatures and humidity. Europe’s second-largest cash & carry and wholesale supplies player, Transgourmet Holding, operates in Switzerland, France, Germany, Poland, Romania, Russia and now Austria too. Transgourmet is one of the leading companies in the retail market whose warehouses are equipped with the latest technologies in order to store massive quantities of fresh food, dry food, non-food articles, and beverages. For Transgourmet warehouse located near Berlin, Greentek designed and implemented a tailored lighting concept that ensures better cargo handling and proper lighting comfort for the working rooms and offices. The general lighting in the dry-food area of the warehouse is provided by 222 linear trunking system luminaires – Lanka IL, all with a narrow 30-degree beam. The narrow beam ensures that light is focused downwards, toward the shelves, instead of being wasted on top of the shelves. On the other hand, continuous-row trunking systems provide maximum flexibility for large open spaces that need proper illumination. The refrigerated-food area and the fresh-food area required an illumination system especially designed for extremely wet and cold environments (up to -28°C). 198 surface-mounted Liwa damp-proof luminaires with IP68 factor that are specially designed for extra cold rooms were used. With a 30-degree adjustable angle, Liwa luminaires are suitable for the tall ceiling and perfect for adjusting the beam to target the light on the products and shelves area. The white color of the luminaires easily integrates them into the industrial and sterile environment of the refrigerating rooms. The project also has an intelligent light control system based on motion sensors and DALI control units that are specially designed to work including in extremely cold conditions of up to -28°C. Given the fact that the warehouse is not in continuous use, fully illuminating it would mean a loss of energy efficiency. 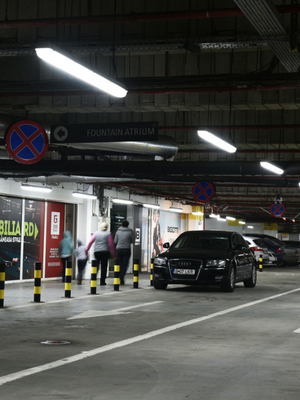 Motion sensors - with a large detection zone: 30 x 4 m (360° radial, passive infrared) ensured that the illuminance is elevated only when workers are detected in the area. After workers leave the area, the lights dim down. Casey, a strong suspended and surface-mounted luminaire, was specified in the cargo preparation areas. This tubular-shaped luminaire with an IP65 factor is waterproof and dustproof. The Casey used in Transgourmet warehouse has an extra-wide 130-degree angle. 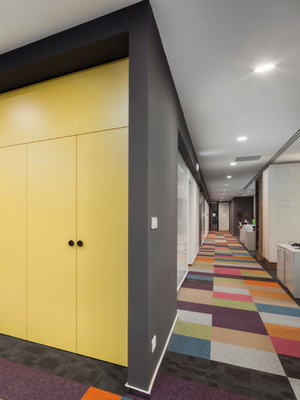 For the office area, we used Kaypro recessed luminaires. The simple and compact design of this modular luminaire provides proper visual comfort for office activities thanks to the 4000 K. The wide 170-degree beam equally spreads the light onto the ceiling and the office room. The average illuminance is 550 lx - a high level of vertical illuminance in order to help workers focus on the task at hand. For the outdoor areas, we used Myriaky luminaires, designed for parking spaces and industrial applications. Myriaky is a high-efficiency luminaire with 125 lm/w at 4000K, great performance and durability. Above the entrance doors - 17 surface-mounted Casey luminaires were used, with high resistance to high temperatures and bad weather conditions thanks to the IP65 factor.